Matt was a little boy who loved elephants. In fact, he was just plain out fascinated by them. Matt had a different feeling about elephants from anyone else around, because it always made him sad to see elephants performing when he went to a zoo or a circus. It this all people used elephants for, or did they have another special purpose? Matt became so serious and focused on elephants that he started reading and studying everything he could find about these amazing animals. And then one day, knowing how much Matt absolutely loved elephants and wanted to learn more about them, his mom and dad took him to the country called Africa where elephants lived in the wild. Boy, was Matt happy and excited about this trip. While in Africa with the elephants, Matt learned a very special lesson. When you read this book, Matt Found God in an Elephant, you will learn all about Matt’s special lesson. 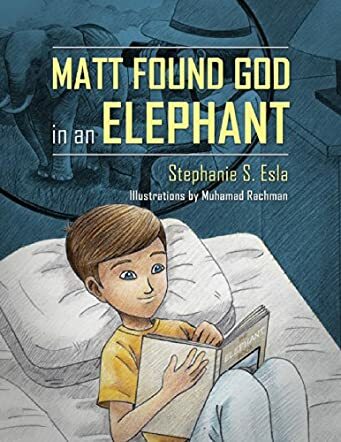 When I first saw this book, I wasn’t sure what I was getting into with Stephanie S. Esla’s Matt Found God in an Elephant. After reading this wonderful and interesting book, it was easy to understand why Ms. Esla found the need to write it. This story is so adorable, and I love the affection this little boy had for these huge animals. And the spiritual lesson so vividly and sweetly taught in this book will help your children make valid and valuable decisions in their young lives. The illustrations are beautifully created to fit this story so well. I love the colors, the characters, and the excitement on their faces, as well as the circus scenes and other scenes of the elephants and people. Your child will treasure this wonderful and valuable addition to their library.